Bike-sharing rolls into new parts of the world. The Arabian Peninsula gets a permanent bike-sharing system. On February 16, 2013, BYKY Bike-share by nextbike began serving Dubai, United Arab Emirates with 100 bikes and 10 stations. The solar-powered stations are placed near the city's Metro stations to extend the travel options of the transit system's riders. As proof that bike-sharing is reaching new heights in the world, there is a BYKY bike station adjacent to the Burj Khalifa, currently the world's tallest building. Last year in nearby Doha, Qatar there was a pilot bike-share program, Qbike, for six months. There is hope to bring that one back as a winter seasonal program. 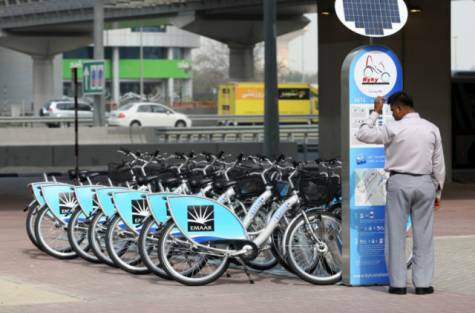 According to Gulfnews, BYKY can be accessed, as with most nextbike systems, by membership card or credit card at the station kiosk or by mobile telephone. Within the last year, nextbike has opened programs in eastern Europe, the Mediterranean area, and the Balkans. In far western China almost bordering Kyrgyzstan, bike-sharing made its debut in Aksu City, Xinjiang this week. The first station with 20 bikes of the service, which will eventually include 500 bikes and 20 stations, opened to celebrate the the end of the Chinese New Year Spring Festival. 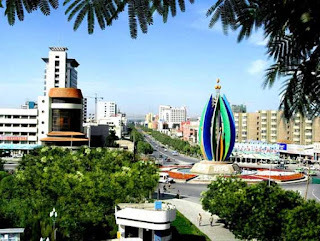 According to the Xinjiang Daily, 300 eager Uyghers signed up for the bicycle access card the first day! The access card requires a ¥200 ($32 US) deposit plus ¥100 ($16 US) value to cover overage fees for a bike kept longer than the initial first hour, at no charge. If needed, the access card is refillable or refundable. For 2014, an additional 30 stations and 1,100 bikes are planned for this city of 600,000 residents. The Aksu system's equipment is similar to the equipment of the mega system in Hangzhou, China. It is designed and being installed with the assistance of the Hangzhou Bicycle Service. The Bike-sharing World Map is the #1 resource for bike-sharing systems. It shows new systems coming online which might not be covered in The Bike-sharing Blog. With over 3 million page views and constant updates, it is known as the best way to keep up with the ever changing bike-sharing world.